"INCREDIBLE! It's like nothing I've ever tasted before!" "Passion fruit and maple syrup . . . together at last." A flavor new to the world has been invented! Maple syrup and passion fruit concentrate are married at last into a delicious all-natural combination. Try some today and live happily ever after. An egg-shaped fruit that is also called a lilikoi in Hawaii, the passion fruit is native to Brazil but is grown throughout the tropics. Its highly aromatic juice has an intense, astringent flavor, while the texture is jelly-like and watery. The raw juice is highly concentrated. Used by native Americans for centuries, maple syrup is a natural sweetener made from the sap of sugar maple. 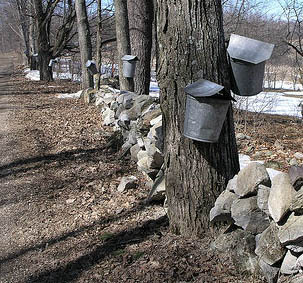 In cold climate areas, these trees store starch in their stems and roots before the winter, which when converted to sugar, rises in the sap in the spring.